One of the most magical holidays you’ll ever experience with your kids is a ski holiday. However, organising a family ski trip may seem daunting as there’s a lot of boxes to tick and things to consider when travelling with kids in tow – a good ski school with English speaking instructors, restaurants that the kids will like, a good choice of runs to suit all abilities, a resort that’s not too noisy at night, short transfer times from the airport, to name a few! The first step is deciding where to go. 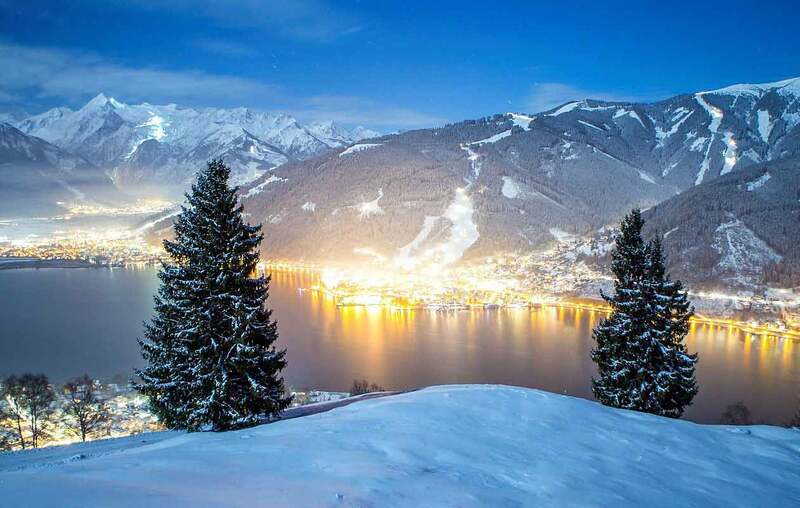 We opted for Zell am See in Austria, a scenic resort with wide, tree-lined slopes overlooking Lake Zeller See. The charming town centre has a great choice of restaurants and cute bars where you can enjoy a Glühwein after a day’s skiing and loads of little shops for stocking up on snacks for hungry kids! The search for accommodation can be mind-boggling with an endless choice, ranging from four-star hotels on full or half board basis, to B&Bs and self-catering apartments. We came across a B&B in Zell am See called Haus Ashling which was situated directly on the slope just a short stroll from the town. Run by an Irish couple, Eugene and Margaret, we found rave reviews online from guests who had stayed there previously about their hospitality, ski-in, ski-out location, quality of food, etc. A few emails back and forth and we were sold. True to their reputation, the hosts couldn’t do enough for us. All we had to concern ourselves with was getting to Salzburg – they promised to organise everything else! A few months later, we arrived on a Ryanair flight direct from Dublin ready for our first family ski adventure. Haus Ashling had arranged a bus transfer for us and other guests arriving on the same day so two hours later, we were greeted by the charismatic Eugene in a snowy Zell am See. First stop was the ski hire shop so that we could be kitted out with skis, boots and lift passes ensuring we were ready to hit the slopes the following morning. Guests of Haus Ashling can avail of a 20% discount on ski hire. Eugene had already booked the kids into ski school for us so everything was so hassle-free. Then it was on to our accommodation where a warm welcome from Margaret awaited us. It’s the personal touches at Haus Ashling that make it a winner – the friendliness of the hosts, an honesty bar where you record what you take and pay at the end of the week, guided early morning ski runs, along with books and board games at the disposal of their guests. One of the highlights for me was luxuriating in the outdoor hot tub under the stars on a frosty night. Heaven on earth! Ski school in Zell am See runs from 10am until 3pm daily. Children are supervised and get a hot meal during lunch hour so parents can enjoy a decent amount of ski time to themselves. Haus Ashling is situated on the ski slope so competent skiers can easily ski down to the lift that brings you up down the mountain, otherwise it’s a short seven minute walk downhill to the lockers and lift. On the first morning, it’s a bit stressful getting everyone suited, booted and up the mountain for the 10am start at ski-school. We hadn’t factored in the queues for the lift at morning peak time or how long it would take to get everyone ready. Thankfully, Eugene from Haus Ashling saved the day! He kindly drove us to the lockers and escorted the kids up the mountain to ensure they got to ski school on time. Phew! Lesson learned so we got our act together after that! It really is amazing how quickly children progress from being total beginners at the start of the week to skiing down the mountain by the end of it. Ski school is so much fun and each afternoon we were greeted by two happy boys, eager to show off what they had learned that day. On the last day of school, there is a big race with a prize-giving ceremony and every child gets a certificate to bring home. 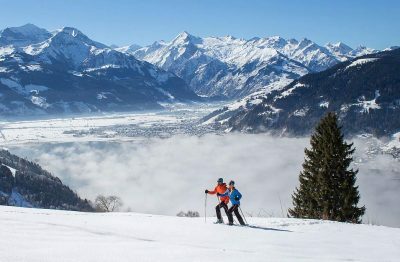 Zell am See offers a good mix of runs catering for all levels of skiers and an impressive lift system including several gondolas to whisk the crowds up the pistes in comfort. An adventure ski world awaits children in the Dragon Park and Kidslope while the resort boasts the longest Funslope in the world. There’s also lots to do after the lifts shut – the Maisiflitzer Alpine Coaster in nearby Kaprun, tobogganing runs, night skiing or the weekly snow night in the town. Our visit coincided with the Night of the Balloons – a magical display of skiing and fireworks amidst a backdrop of illuminated hot air balloons. What was even better, is that it all took place right on our doorstep just out the back of Haus Ashling! Once you go on your first skiing holiday with kids, there’s no going back! It’s an amazing holiday experience that kids of all ages will enjoy. Exclusive Social Photos: The Liquor Lounge Galway turns Pink with Gordon’s Gin!